Celebrities are supposed to set us up for the week. They are supposed to inspire us with the best looks; so it’s utterly disappointing when the weekend rolls by and there aren’t any serious fashion inspo to guide us into the new week. This past weekend, however, did not disappoint as it came with more than enough dosage of Nigerian celebrity style. 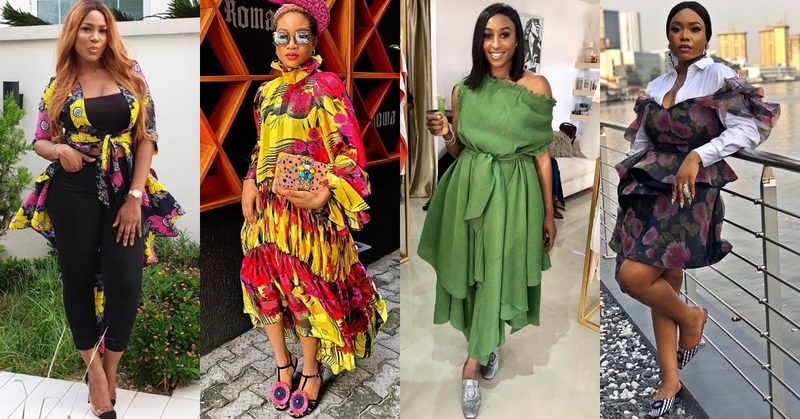 In this list, you’ll find interesting ways to bring your wardrobe up a notch based on our best celebrity, influencer and socialite style moments from this past weekend. Just take a look at how fantastic and creatively structured this green dress is on Veronica Odeka. She rocks the look like it was made exclusively for her and all we can say is: the future of fashion is Nigerian! Mimi Onalaja is yet another celebrity who knows how to work fashion to suit her purpose. She did it again with this layered number and looked just brilliant! We know the Goodhair Co-CEO loves to look elegantly chic but we love how she pulled out a sassy number this weekend. Beauty entrepreneur Nnenna Okoye let this one-shoulder, statement jumpsuit number by Yutee Rone do all the talking as she attended a birthday party over the weekend. She delivered a healthy dose of trendy and elegance and we love it! Truly, we don’t deserve the TheLadyVhodka. Over the weekend, Jennifer Oseh gave us a combination that is eccentric, fun, totally unique and full of life. It’s not every day you see a combination like this. We’ve come to expect Toke Makinwa as a regular on our best-dressed lists and this weekend was no different. The all-around hustler let purple reign this weekend as she stepped out in this gorgeous boubou and turban. Ini-Dima Okojie is such a fashion girl alright. The actress who is building her style icon portfolio stepped out for a brand launch in this entertaining number and she looked simply incredible. This is the ultimate laid-back girly girl look. It’s simple, chic and shows off femininity in a way that’s not “in your face.” Ozinna gets an A for effortlessness. Asides from being the ultimate blogger, Linda Ikeji wants you to know she’s got it in the style department. Her new mama snapback is lit and this weekend, she showed it off in a simple but very chic way. There’s nothing that describes fun as much as Kaylah’s outfit. It’s airy and free and we bet it’s the key reason for her huge smile and joyful disposition. Angel Obasi gets it almost all the time and we are not mad about this look at all. In fact, we are already ordering our pair of pants – preferably in black. This look is very modern and contemporary – what’s not to love?